It is difficult to imagine a worse advertisement for the 1980s. Horrible hair. Horrible soundtrack of limp rock. Horrible script. Horrible performances by horrible actors. Horrible villain spouting horrible one-liners with a horrible accent. And the most horrible, jingoistic, Reagan-era cowboy mentality pretending to be a viable solution to a crisis. Iron Eagle somehow passed for entertainment in 1986. It's the story of Doug (Jason Gedrick), the hot-headed teenaged son of Air Force pilot Ted Masters (Tim Thomerson). On a mission over the Mediterranean, Ted is shot down, captured, tried and sentenced to be executed by an enemy country (Libya, although never named). 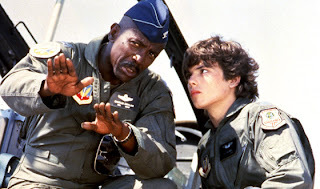 When the official U.S. response is timid, young Doug, who is a hotshot fighter pilot himself, partners with the grizzled and semi-retired Colonel "Chappy" Sinclair (Louis Gossett Jr.) to plan and launch the most unlikely of rescue missions. Doug and Chappy somehow arrange to steal a couple of F-16s, then they pull-off a couple of unauthorized mid-air refuelling manoeuvres, before they bomb the Libyans into submission, destroy their air force in a couple of dog-fights, rescue Tom, and jet home. The U.S. Air Force showed unusually good judgement and mercifully refused to have anything to do with Iron Eagle due to the portrayal of a fighter jet theft, but that may have been just a most convenient excuse because surely even the Pentagon would have recognized the stench emanating from the fetid script. Canadian director Sidney J. Furie has a chequered resume, and he did his reputation no favours by directing this embarrassment, plus several sequels. Louis Gossett Jr. chews through his lines looking for nothing but impact but finding only cartoon-level intensity. Jason Gedrick needs only a few minutes of screen time to prove that he is all hair and no talent, but unfortunately gets a lot more than a few minutes. The rest of the cast may as well have been drawn in with thick felt markers for all the nuance and texture that they bring to the movie. Iron Eagle stands as a monument to the level of brainlessness that movies can descend to when catering to the lowest common denominator of dumb action and blind, revenge-driven so-called patriotism.